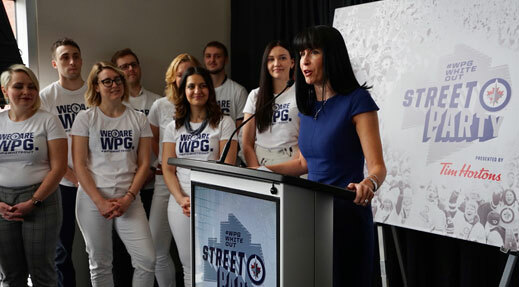 The 2019 #WPGWhiteout Street Parties presented by Tim Hortons will once again fill the streets of downtown Winnipeg, creating a celebration destination for fans to cheer on our Winnipeg Jets and our city. Economic Development Winnipeg, True North Sports + Entertainment, the City of Winnipeg, and the Downtown Winnipeg BIZ, have teamed up again this year to provide the organizational support and resources to host the Street Parties. Each Street Party will feature large video screens for viewing the game, food trucks, vendors serving beverages and snacks, fun activations, and an in-game host and DJ to keep fans entertained pre-game as well as during commercial breaks and intermissions. The area will also provide the appropriate security and infrastructure to ensure a safe and well-managed environment for all attendees. “The 2019 #WPGWhiteout Street Parties presented by Tim Hortons are a chance for us to come together as a city and celebrate. They’re also a chance to make an impact in our community while putting a spotlight on what makes our city unique. Winnipeggers celebrate by giving back – this is what we do best,” said Dayna Spiring, President & CEO of Economic Development Winnipeg. Family Zone presented by FreshCo. Back by popular demand, the alcohol-free FreshCo. Family Zone at Millennium Library Park will return this year. With room for up to 4,000 fans, the Family Zone provides space for families with young children to take part in the celebratory atmosphere once again. New for 2019, tickets for the 2019 #WPGWhiteout Street Parties presented by Tim Hortons will cost $5 each. If you have a ticket to a Winnipeg Jets home playoff game, a ticket to that day’s Street Party is included. All proceeds will be distributed to local agencies, making investments in the community through United Way Winnipeg around three key themes: addiction, homelessness, and mental health. All proceeds from Street Party ticket sales will go to agencies currently working on addressing these issues in our city. As part of this partnership, United Way Winnipeg will also assist in distributing 500 complimentary tickets for each Street Party to those they work with in the community. Fans are also encouraged to bring a tin for the bin for Winnipeg Harvest during all Street Parties. “We are excited to build on the success of last year’s Street Parties and present an even better fan experience this year. As well as creating a community to celebrate together downtown, we are especially pleased to make this bigger than hockey by driving awareness and funds to deserving organizations across the city,” said Kevin Donnelly, Senior Vice President, Venues & Entertainment with True North Sports + Entertainment. Tickets to the Street Parties will be available for purchase through Ticketmaster with a limit of four (4) per person. Fans are encouraged to purchase their tickets before coming to the event as there is no guarantee that tickets will be available on game days. Fans who don’t have online access can purchase their Street Party tickets at the Bell MTS Place Box Office. The Street Parties will take place before and during every Jets home playoff game, beginning two hours prior to puck drop unless otherwise announced. The first street party will accommodate approximately 15,000 people, expanding in capacity as needed throughout the playoffs. Tickets not sold in advance will be available for purchase on game days at the Bell MTS Place Box Office. More details about the 2019 #WPGWhiteout Street Parties presented by Tim Hortons will be made in advance of Game 1 of the Western Conference First Round. Cost details for all Street Parties will be available at the end of the 2019 NHL Playoffs. As part of the 2019 Stanley Cup Playoff festivities in Winnipeg, True North Sports + Entertainment will once again be hosting away game viewing parties at Bell MTS Place. Viewing parties will begin during the Western Conference First Round allowing fans to share in the excitement as a community right from the beginning. Tickets will once again be $10 (inclusive) with net proceeds going toward the True North Youth Foundation www.tnyf.ca. Each fan will receive a We Are WPG rally towel with their ticket. More information about the 2019 #WPGWhiteout Street Parties presented by Tim Hortons is available on wpgwhiteoutstreetparty.ca. Updates will be posted on this website as required. During the Street Parties, fans can access live updates on Twitter (@EDWinnipeg). Economic Development Winnipeg Inc. (EDW) is the lead economic development agency for Winnipeg. EDW facilitates investment promotion and attraction, capacity building, tourism development and the management of market data. By utilizing competitive intelligence and by fostering relationships with industry leaders, government officials and community stakeholders, EDW evaluates potential opportunities and innovation drivers to develop key industries and define opportunities for future economic growth. EDW also supports targeted sector, community and social development, and promotes Winnipeg’s diverse economy and high quality of life.